Expect delays on Centreville Road/Elden Street between 9 p.m. and 5 a.m.
Beginning on or about TUESDAY, OCT. 6, 2015, and continuing through into November, Dulles Corridor Metrorail Project crews will be building a bridge that will carry future Silver Line trains over Centreville Road. The project is expected to take place over approximately15) to 20 nights. 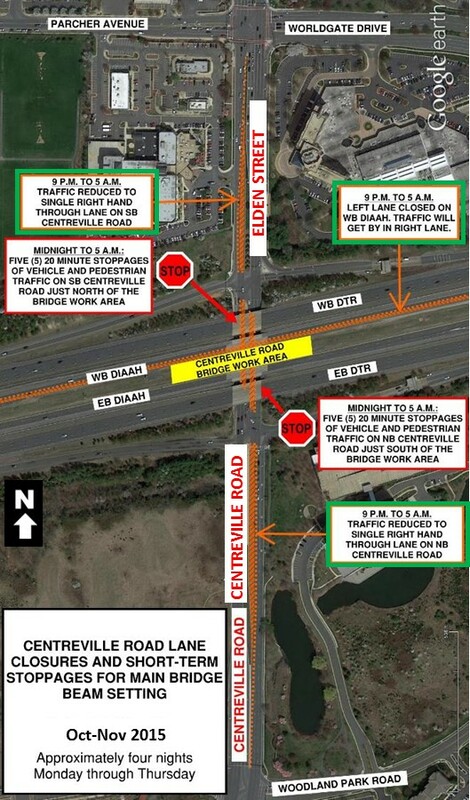 To ensure the safety of drivers, pedestrians, and bicyclists while work is taking place overhead, Centreville Road will be reduced to one lane in each direction from 9 p.m. to 5 a.m.
Also, between midnight and 5 a.m., there will be intermittent full closures of Centreville Road in both directions. Full closures will vary from five to a maximum of 20 minutes each and will be implemented during work that requires spanning the width of the roadway. The majority of construction activity will take place from the median of the Dulles International Airport Access Highway (DIAAH). Two large cranes will be positioned on the DIAAH and will require the closures of the left lanes, both eastbound and westbound. A third crane will be located within the lane closure area on Centreville Road. Police and flaggers will be on site to ensure public safety. Please remain alert as you pass through the construction zone.